Six degrees separate you from Kevin Bacon. But what separates you from your competitors? One of the most powerful ways to set yourself apart from the masses is to use video. Video gives you the edge on the competition, allowing you to speak directly to potential clients and customers and convince them of your expertise before they even shake your hand. I've found that there are six highly effective ways to shoot, produce, and promote videos. Each of the following, when used correctly, can boost conversion rates and engage your audience better than any other marketing element. You shoot your own videos. Using the most visually pleasing background in your office, you can shoot a quick and dirty video yourself. As long as you make sure the lighting, sound, and video quality are on point, this is an excellent way to get videos up fast. They can work well with breaking news or FAQ videos. Who's using this technique? FWM client Steve Richardson makes excellent use of the videos he shoots in-office and sees great results using his home-grown videos. Create a green-screen studio in your own office. This method is the next step up from shooting a quick and easy in-office video. Our video team, or a video team of your choosing, will come into your office and set up a mini green-screen studio, complete with a video camera, lighting, and sound. You will be able to shoot videos at your leisure, and then task one of your assistants to use video editing software—we recommend Premier—to edit your videos and load them to your site and YouTube. Who's using this technique? Gerry Oginski has been successfully employing this video technique for quite awhile. He shoots the video in the studio we set up and then edits and loads them himself. A true video do-it-yourselfer! Shoot video in the office, and then send it out to for production. For a step up, shoot video in your in-office green screen studio, and then send it out to a video production company, such as our very own Gearshift.TV team, where the video will be edited, optimized, loaded, and promoted online. With this method, you can be in your own videos, but still have a professional produce the video for maximum effect. Who's using this technique? Hupy & Abraham are making excellent use of their in-office video studio and our production services. In this example, a client gives a testimonial in Hupy & Abraham's video studio. Having an in-office studio is awesome for this purpose, as clients are already comfortable in your office and more at ease about giving a powerful testimonial. Go to a professional video studio. By going to a professional video studio, all you have to do is talk into the camera. Most studios—ours included—will do all the work for you. From scripting the videos to editing and optimizing, a professional studio takes the worry out of shooting high-quality videos for your business. Who's using this technique? Hupy & Abraham love coming in to shoot videos. They know that their videos will be of the highest possible quality and that they will show their attorneys in the best possible light. And all they have to do is show up! Shoot a spokesmodel video. Don't want to appear on camera? Hire a spokesmodel to speak for you! We have a bevy of professional spokesmodels who can deliver your message with power and conviction. Just be sure your state bar allows this before you proceed. Use your own voice and images to create a professional video. A video doesn't always need to be you speaking directly into the camera. Videos using still images, with voiceover and text added, can be a powerful, refreshing change from your average, “talking head” video. Which Technique Do You Want to Try First? Which video appealed most to you? Which do you think your ideal client would appreciate the most? Once you decide, all you need to do to get the ball rolling is call 888-886-0939. Together, we can help you not only separate your business from the pack, but lead it. 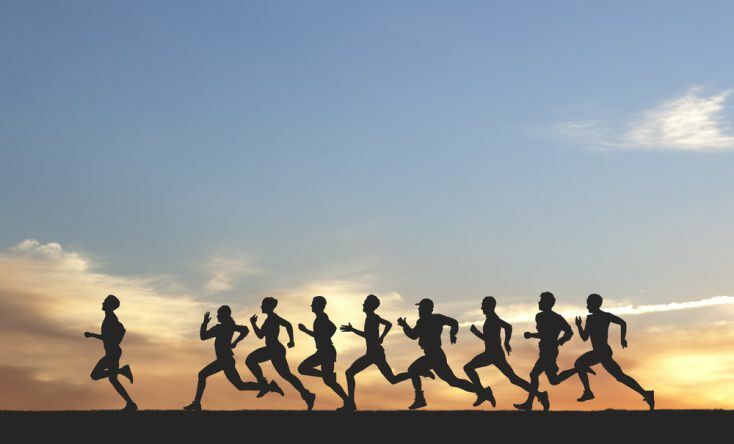 It's time you won the marketing race and soundly beat your competitors. Is Your Video Good Enough?